Affirming that changes in how we eat aren’t part of some food fad, a new consumer survey from Coast Packing Company and Ipsos Research indicates that younger Americans are even more receptive to including animal fats in their diet than they were a year ago — and are acting accordingly. And millennials – those ages 18 to 34 — are not alone: overall, 13 percent of all survey respondents are open to animal fats, up from 9 percent a year ago, and 9 percent say their consumption has increased, compared with 6 percent in 2015. Among millennials, attitudes have changed significantly. In this year’s study, 24 percent say they are receptive to animal fats, a marked increase over the 15 percent who held that position last year. In terms of what members of the youngest demographic are actually eating, it’s a similar story: 20 percent of millennials report having increased their intake of animal fats – a hefty jump over 2015, when that figure stood at 13 percent. According to U.S. Census Bureau data, millennials are now the nation’s largest generation and include some 75.4 million people. Forty-one percent eat out at least twice a week, compared to 37 percent of Baby Boomers and a like number of Gen Xers, per a study from foodservice research firm Technomic. Millennials spends 15 percent more of their discretionary income on experiences than other demographic groups. 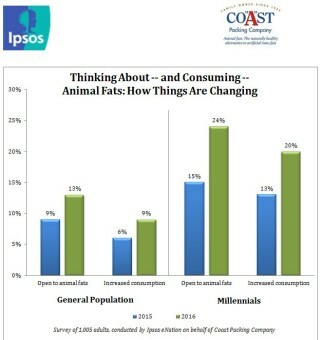 “This year’s results show both more openness to animal fat consumption and higher stated consumption of animal fats since the last time Coast and Ipsos posed these questions,” said Eric R. Gustafson, CEO, Coast Packing. “Clearly, healthy animal fats like lard and beef tallow are back, proving that last year’s survey was not an aberration. Everything old is new again, or so the expression goes. And that’s true in spades for one hugely influential segment of the population that may not quite remember the old days. In today’s foodie culture, taste is on par with health concerns — and nutritious animal fats deliver both. The Coast Packing/Ipsos study was fielded from Oct. 2-5, 2016. Ipsos eNation surveys consist of a minimum of 1,000 completes with adults 18 years of age or older in the contiguous United States. The sample includes individuals selected from the online segment of Ipsos’ iSay/Ampario Panel, and is balanced to be representative of the general population based upon region, gender, age, and household income data from the U.S. Census Bureau. Results have a margin of error of +/- 3 percentage points. For a copy of the survey results, please email admin@edgecommunicationsinc.com.